The second men’s match of the day was a Pacific derby if there is such a thing. Nauru would have gone into this match knowing that the Tongans have put together a tough squad in the past couple of years and noted the Tongans great success at last year’s Pacific U16 Championships. Tonga did not disappoint and put up a great fight, only to be outdone by the footy experience, smarts and superior marking skills of Nauru. Pre-match featured the soulful singing of Tonga spreading from the change rooms and all around BISS Oval 2 – possibly from the best choir ever to play Aussie Rules – and when they came to start the match they contrasted their angelic song with a high energy Tongan “Sipi Tau” that is both clearly threatening and manic. It was kindly applauded by their Nauruan opponents before all concerned took their places. What was not seen by those outside was the pre-match address given to Tonga by GWS major signing (and cousin of Tonga captain) Israel Folau and former Port Adelaide coach Mark Williams who is now GWS senior assistant coach. From the start it was a hard and fast match with Nauru settling first and making more of the ball use by both hand and foot, but even so the sheer attack on the ball from Tonga was often enough to turn the ball around and they created their own opportunities. Nauru took a 14 point lead in to quarter time and it looked like Tonga may have been out of their depth against. But lead from the front by Peni Mahina Tonga gradually forced their way back into the match, both teams pushing the limits of legal contact which the umpires were happy to let go for the most part. Tonga would fight back with goals two goals bringing them within eight points at half time. 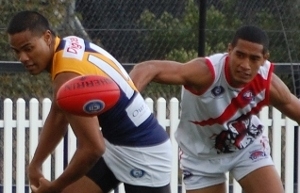 Despite his small stature the smallest ruckman in the world Nauru’s Robroy Grundler at 175cms continued to leap high and was rarely beaten, be it in the ruck, marking or in the packs. 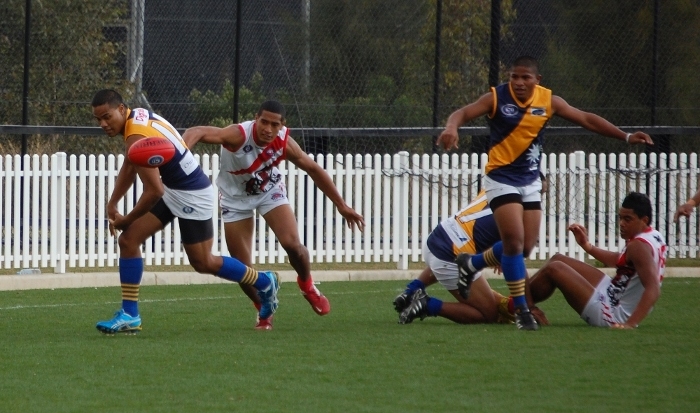 But the third quarter saw more hard footy with Nauru winning in the air but unable to pull away. The final quarter saw Tonga start seven points down and then bring the match to a one point ball game early in the quarter when captain Peni Mahina marked strongly, went back and slotted the goal. But Nauru did not panic and continued to kick to one out options who marked confidently and set up goal scoring opportunities. In the end Nauru was too strong finishing 8.7 (55) to 5.5 (35) winners and showing that anyone hoping to get past them will have to wear the hits and beat them with skill.